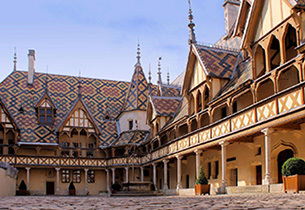 The city of Dijon has been cultivating the tradition of chocolate and the skills associated with it since the 18th century. It is better known, however, for its fields of mustard than for its cocoa trees. But for many years, Dijon was also France’s gastronomic capital, a title it has tirelessly sought to recapture. On a more scientific note, Dijon is home to cutting-edge research into nutrition and food science. Chocolaterie de Bourgogne is a partner of the Centre des sciences du goût et de l’alimentation, an institution that has earned Dijon a place on the list of finalists to be designated a « ‘City of Gastronomy ». This commitment is part of a larger process to anchor our plant in the Burgundy landscape, and to make chocolate a natural element in French and local gastronomy. To this end, Chocolaterie de Bourgogne is lending support to creating a sustainable connection between the world of cocoa and the region’s great wines. In the same spirit, we support initiatives and local talents via a growing number of partnerships. This is particularly the case with AgroSup Dijon, an engineering school specialising in the fields of agronomy and agri-food, as well as with the region’s universities in terms of training and employment.